Chief Minister Andrew Barr address the Assembly. File photo. 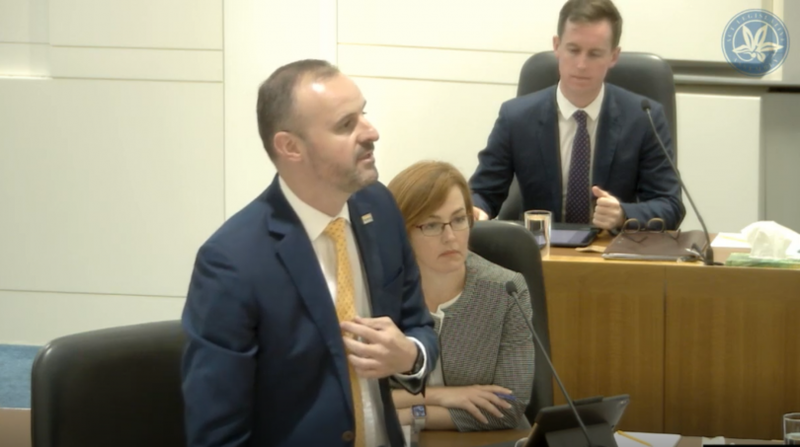 The ACT is to get an eighth Minister to meet what the Chief Minister Andrew Barr says is the growing needs of the territory. Mr Barr has opened the caucus process for a new Labor Minister, and the caucus will select a new Minister later this week. “In response to our city’s growth, and to achieve our plan for the territory, we will be expanding our Ministry team. A new Minister will allow new priorities to be delivered, resulting in better outcomes for Canberrans,” Mr Barr said. Mr Barr said Canberra was now a city of 420,000 people, with the ACT’s population projected to reach half a million people in the next decade. “This growth has supported a stronger local economy that is growing faster than the rest of the nation. We have record levels of employment in the territory, with 229,000 Canberrans in employment and the lowest unemployment rate in the country,” he said. The Chief Minister said the Government was building a public healthcare network that delivered free healthcare when and where Canberrans need it, including more nurse-led walk-in centres and more bulk-billing GP clinics in the south of Canberra. “The conversation that the Government has started with our school students, our teachers, and our community will lead to a better education system for the ACT in the future. The Government is committed to providing consistent, equitable and quality outcomes for children and young people and the Future of Education strategy will help guide our efforts and investment across the next 10 years,” he said. Mr Barr said the Government’s campaign to restore territory rights on voluntary assisted dying must continue. In my experience it’s not ministers who get things done it’s the public service departments that actually do the research and work. Ministers just sign things off and turn up for openings (and occasionally put some impossible scheme to a department to make reality). If things need to be done, hire more workers. ..but they need the right headings. If they are pushing ACT in the wrong direction.. their work is not for good/country. lol - if ministers ceased to exist the public service would still be working. Most sensible community minded policy is created by someone sitting at a public service desk (not the clueless pollie who’s more likely to push some faction agenda for regional votes). During caretaker before elections the world doesn’t stop because ministers are off kissing babies. Can we get a new chief minister while we're at it ! An extra 80 thousand left wing voters? Yet another chance to ignore their 'local government' responsibilities and be too busy for the people of the ACT. Do you have any idea how the ACT Government works? Phillip Wurst it’s probably not far behind the current Liberal, Labour or Greens agenda of high immigration and selling Australia to foreigners. Does anyone. More so do they do any....work that is. Wonder if CM Barr's new minister might be from his own party? By handing over many very important portfolios to a cross-bench Green, he's already admitting that there isn't enough talent/ability in his own party ranks to fill a cabinet. Who's next: Emile Brunoro?